A record number of postal votes have been received, with 2,906 applications being sent in by the deadline, but some voters did not receive their forms. Deputy Peter Roffey has apologised for the error and says those affected have still been able to cast their ballot. Some islanders were turned away from voting stations as they were still registered at their old addresses, but Deputy Roffey says he doesn't think it's affected the outcome. The count, which ensures there is no voter fraud or spoiled ballots, has resulted in 14,370 votes being cast. Voter turnout in the #gsyreferendum is 45.1%. The threshold has been met and the winning option will be implemented. Our Political Correspondent Clare Burton has been getting reaction from the count at St James Centre in St Peter Port. After the first count Option A has the largest percentage of votes and Option D has the smallest, knocking it out of the second count. 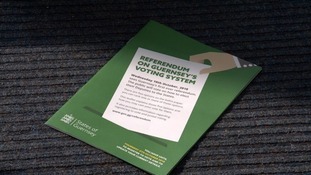 Islanders in Guernsey will find out how their deputies will be elected in future.